I don’t like the beach. I know. I lived on a Caribbean island for 15 months over three calendar years—how is that even possible? Well, I find lying on the beach boring and it makes me really hot, to which the normal response is to go for a swim, but swimming in saltwater makes me itchy and uncomfortable. I also don’t like it because you can’t always see what creatures are around you. When I went swimming in Dominica, a few people on the catamaran with me started watching me and pointing and I was SO scared I thought something was going to eat me! Turns out it was a turtle, but it freaked me out because I couldn’t see it. I prefer going to the river. Mostly found in the north of the island, they’re more secluded and wild. Rivers and waterfalls, and the places you find them in, can be more interesting—there are always differences in landscape, the type of vegetation, the configuration of the rocks and cliffs and the flow of water… The beach can be interesting, as can the area around it, but it’s usually just flat and overrun by tourists. 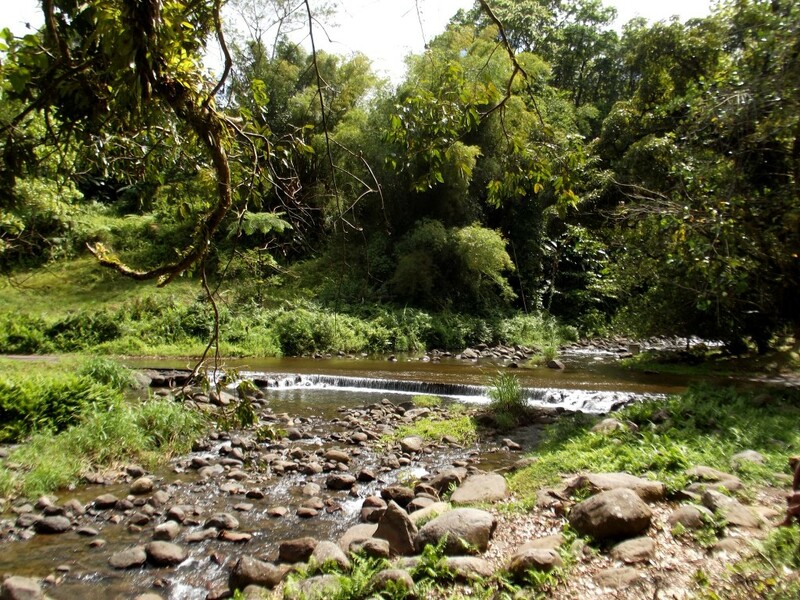 In St Joseph, the town with the most green space and the most rivers on the island, is Coeur Bouliki, a part of a river that runs from farther north. Even though it is a well-maintained area for visitors, and you drive (quite literally) through the river to park, it is out of the way enough that mostly locals and dedicated hikers were around. A Rose de Porcelaine – I’d never seen one this big or tall before! 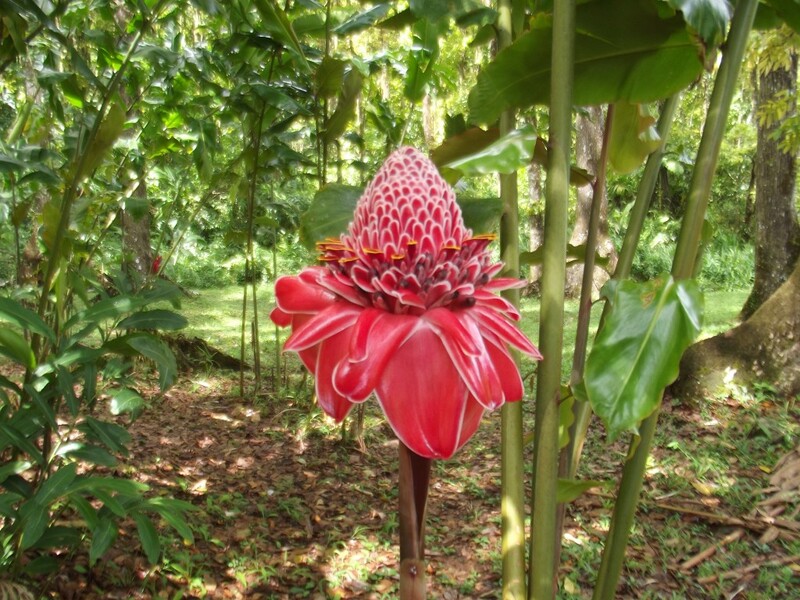 I saw some of the tallest balisier (red palulu) plants I’ve ever seen, along with alpinias (red ginger), rose de porcelaine flowers and fruit trees. We walked farther up the river towards the water purification plant, which is where the hike starts. 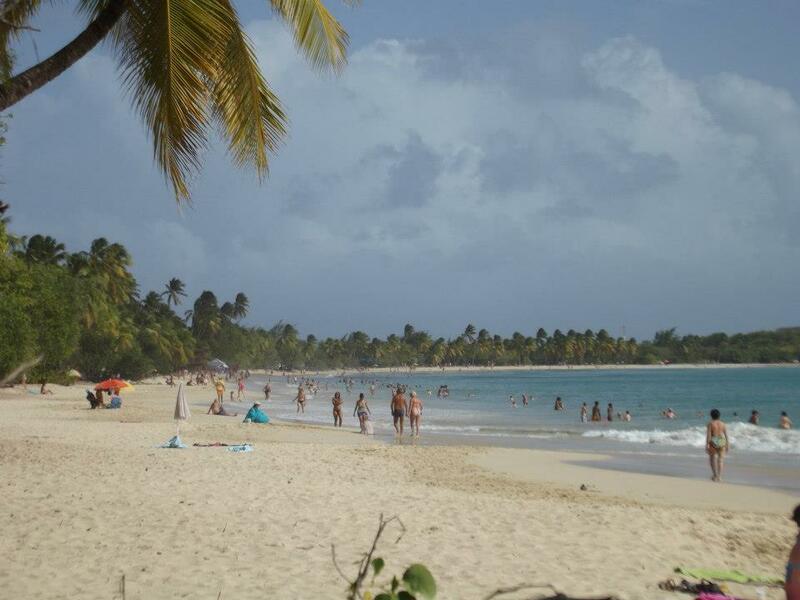 There are a few places to swim and areas to explore or sit down for a picnic or grillade. The town, also called Grand Rivière, certainly lives up to its name. It really is a large river at “le bout du bout”—the edge of the edge. This is the farthest north you can drive and eventually the road just ends and you’re on a black sand beach looking at Dominica. Interestingly, another island is closer to the town than the capital city of Martinique is. The day we chose to go happened to be one where preschool children flooded the area, but we escaped them by walking up farther up the river. Some parts are deep enough you can jump off a rock into the water. You can also continue down the river to Morne Vert, a commune further south. After a picnic, we went for a swim. With the sun shining, the sound of water rushing down the stones, and views of flowers, banana trees and a cow eating and pooping it really is a special place. We drove up to the parking lot in Anse Couleuvre in Le Prêcheur and I realized that this would be my last hike in Martinique, at least for a little while. At the entrance you find the preserved ruins of an old estate that produced indigo and cocoa starting in the 17th century. 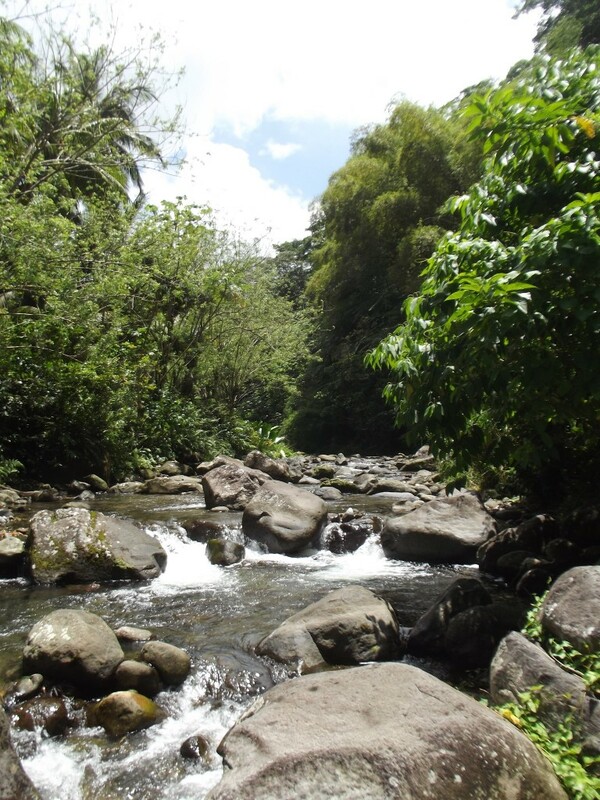 From here, you can choose to spend time on the beach, a wild location with black sand, high cliffs and exceptionally tall coconut trees, stay at an exorbitantly priced but very exotic bed and breakfast, hike to Grand Rivière, or walk to one of the tallest waterfalls in Martinique. The last one is what my partner and I came to do. From the start of the hike, we entered the humid tropical forest marked by ravines and lush vegetation, much of which are trees that were planted for consumption of their fruits: Mamey apple, breadfruit, coffee, cocoa, mango and bitter orange… Whereas the hike is meant to be an easy walk along a river with some uphill recommended for anyone, I wondered why five minutes from the end I was sweating profusely and ready to collapse. It turns out that we were just walking at breakneck speed completing a hike that is supposed to take about an hour and a half in 45 minutes. 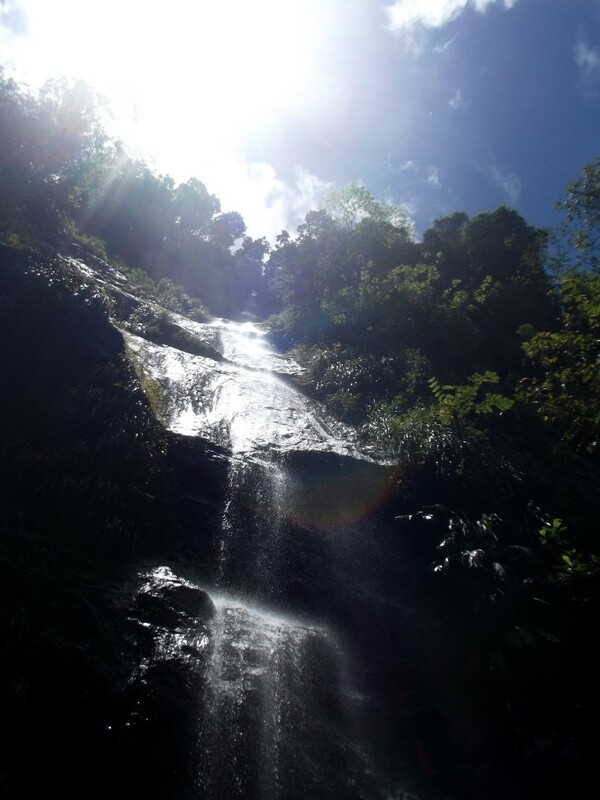 The sweating and aching legs were rewarded when we arrived at the waterfall with a shallow pool to swim in. Surrounded by tall trees and high cliffs, the whole place to ourselves and the water, seeming to be falling directly from the sky to trickle down the rock face, it was easy to feel as though we had found a hidden natural wonder. I find this country beautiful!!! 🙂 I wish to go someday. Hi Elina – there aren’t any that I can think of. I suppose if you go to Grande-Riviere – but it’s at the northernmost tip of the island and only a few buses go there each day. I hope that helps! thanks. I understand that this north of the island is deserted. no apartments to rent there? you just came by bus to swim only and then went away the same day? I wanted a river or a lake with apartment nearby.